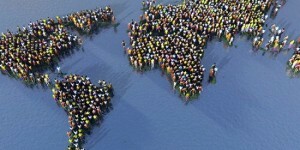 According to the United Nations, our blue planet is now home to 7 billion people, give or take a few. As of November 1st at 11:06 New York time, it is actually 7,000, 272,425. So, as news made its way around the world yesterday, there were various responses. Some used it as a call to denounce Malthus as misanthropy thinly veiled as science and say, we will have plenty of room for you if IF the developed world stops consuming so much. Others have classily argued over who the 7 billionth baby is. My favorite response was found on Tree Hugger, who very simply said: “You Are Now One of 7 Billion People on Planet Earth. Our recommendation: Live accordingly.” There is of course a more in-depth discussion of what this all means for limited resources paired with growing appetites for them over at Dot Earth. I guess I would probably say the same thing to these babies as I would to any other one: You were born into exciting and amazing times, but they are also full of anxieties and concern that a lot of things need to be fixed. So you will have to work hard to contribute to the cause of betterment. Also, that is not going to get any easier for you, so you will have to be innovative, but you will have tools and talent beyond measure to make that happen. You will also have to learn about the role of lobbying in politics if you want all of your efforts to go anywhere. Live in a city. Be close to the people you care about. And yes, you will survive your teenage years. In the time I wrote this, many more babies were born. And we now have 7,000,274,589 people on the planet. What do you you want to tell them?